This entry was posted on Sunday, January 4th, 2015 at 12:15 am	and tagged with Alastair's Photo Fiction, angel, blind, crime, fiction, flash fiction, good luck, luck, mugger, quirky, stone and posted in Light. You can follow any responses to this entry through the RSS 2.0 feed. « Happy New Year 1915! Thank you, my friend. It’s been a good day. Sorry for the typo. In the fourth sentence the word after “out” should be “if” not “it”. Wishing you a very happy and satisfying birthday, David. And a successful new year. Thanks, Teagan. I hope you have a great year as well. Loved it and Happy Birthday!! I think that’s a pretty cool charm. Something you can knock attackers out with is always helpful! Happy Birthday! What a way to use an angel! Thanks. Stone angels are very versatile, apparently. They can be! I carry one with me! First, happy birthday to you! As to the story, I enjoyed this one. The ending reminds me of a sock my wife used to carry with her. It was filled with change, mostly pennies, and she figured she could take out any attacker with a swift swing should it ever become necessary. Happy Birthday! May God bless you with every good thing in the world! Thanks, dear friend. He blesses me a lot, to be sure. Thanks on all counts. Glad you liked the story. Happy birthday! And a very entertaining story. I think we could all use a bit of blind angel luck. Happy Birthday, David! 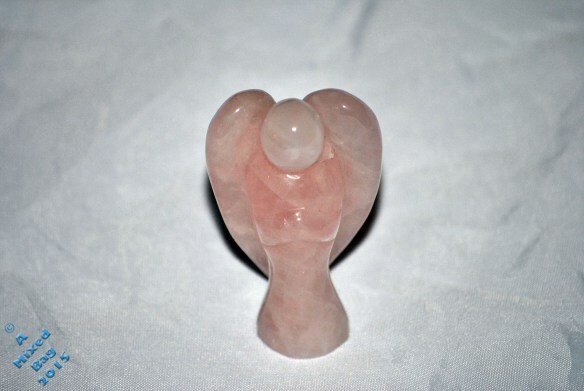 We all could use an angel luck charm to throw at someone from time to time. I hope you had a great b-day. Clever idea. I liked the line, “…air of bland, unfocused benevolence out into the world.” Fun story! Thanks. The fact that the angel didn’t have any distinct features was the first thing that struck me about the picture. That was brilliant. Sorry I didn’t read it on the day you posted it, so happy birthday for Sunday.